Manufacturer & Supplier of Wireless Token Display & Wireless Token Display Unit.. Our product range also comprises of Security Equipment & Systems, Boom Barrier and Fire Extinguisher. We are regarded as recognized firm engaged in manufacturing, supplying and exporting highly efficient Token Display System. 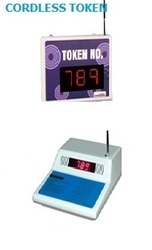 The display system is used to provide some number, as a result, these microcontroller based display allow customers/ visitor to wait without standing in ques. These are specially designed for smooth regulations at any busy place. In addition to this, clients can avail this display system from us in wide specifications.